The Brick Castle: EDF Energy #PrettyCurious : Encouraging STEM Careers for Girls! EDF Energy #PrettyCurious : Encouraging STEM Careers for Girls! Only 1 in 4 people working in core STEM roles in the UK are female and jobs in science, research, engineering and technology will rise at double the rate of other occupations between now and 2023. 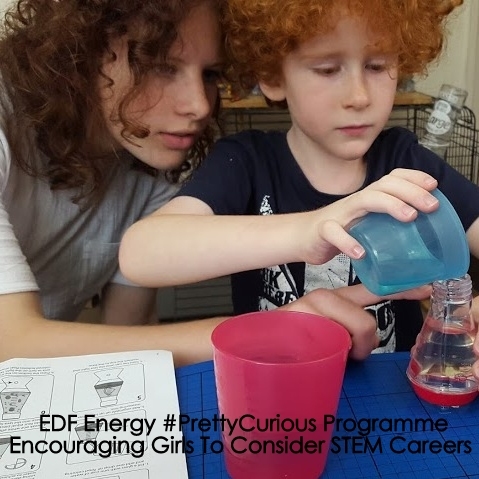 EDF Energy's #PrettyCurious campaign aims to inspire girls' interest in STEM subjects (science, technology, engineering and maths), something which I feel passionately about. I've tried to pass on a love for STEM subjects to my children and I'm proud to have raised a female future scientist. EDF Energy are committed to bringing more young women into STEM careers and have already beaten their target of a 30% female STEM graduate and apprenticeship intake, with an awesome 35% in 2017. 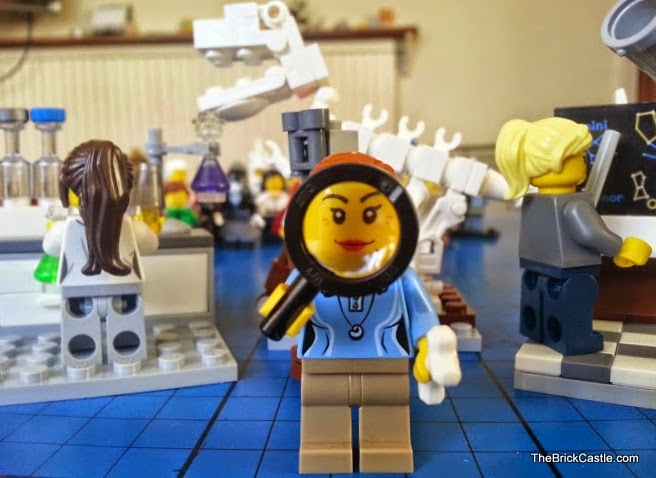 They've teamed up with Britmums and asked me to find out my daughter's feelings about STEM subjects and careers, and her reasons for choosing STEM subjects at exam level. 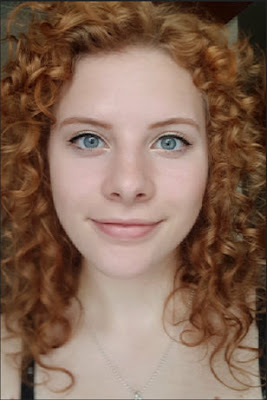 My daughter is 18 and studying Biology, Chemistry and Maths at A Level. Maths is her favourite subject. She's interviewing for places at university and hopes to follow a medical career in dentistry. She will be a scientist. To keep us busy while we talked, we were sent an EDF Energy Pretty Curious Kit. It included an amazing littleBits Droid Inventor Kit and a Pretty Curious Google cardboard headset - to experience life as an architect on The Shard in the 360° virtual reality Future Me film on the Pretty Curious website. The website shows some of the huge range of possibilities with STEM subjects and why young people should make sure they keep their options open for the future. You can also create your own Future Me avatar and take the Career Quiz to find out which careers in STEM roles could suit you. The first thing I realised as we talked was that my daughter didn't even feel that she was doing anything unusual. I was really surprised by that, the world has changed so much. I was one of only two girls who took GCSE Chemistry at my school and there were only a handful of us doing the new Computer Studies GCSE. I knew I was not the norm and I never understood why because these subjects are the future and can only become more relevant as time goes on. My daughter can see that. Almost every work role now uses a computer and advances in technology mean that tasks and equipment are changing rapidly. Keeping up gives you the advantage. For as long as I can remember my daughter has wanted to know how things worked, what was over the fence, why it happened? She learned to talk early and never stopped asking questions. I always try to answer children's questions honestly and have a need-to-know attitude myself. I love the internet for that. We have all the knowledge of the world now in our hands and there is always something to find out. My daughter can't really remember being encouraged to like science, but we cooked and made volcanoes and hunted for bugs, She has played with computers since she was tiny, but didn't associate it with technology. She didn't realise she was learning about engineering, but she loved LEGO. When she measured ingredients with me and put together a cake mix, she wasn't aware she was practising her maths. STEM subjects are amazing and I've loved introducing my children to them. All of our children had the same opportunities to explore the world and they have all embraced the idea that they can do anything. I'm actually really proud. I helped my children develop a love of STEM subjects and they didn't even realise. To them it wasn't learning, it was playing. 3 years ago I bought my daughter the LEGO Institute Research Set, which features 3 female scientists. I said at the time "In 15 years time when I show my grandchildren this set, my wish is that they won't even comment on gender". What I found out from talking to my daughter is that she doesn't comment on gender. She doesn't see it as a barrier, she isn't a traditional feminist, she isn't making a point. She is simply doing what she's interested in doing. I hope that more young girls can have the confidence to do the same. I’m working with EDF Energy and BritMums to promote the #PrettyCurious programme. Visit EDF Energy Pretty Curious website for more information and advice about why you should consider STEM subjects at GCSE and beyond, and the thousands of different jobs that it includes. This is a collaboration with EDF Energy and Britmums and we were paid for our time. When I was at school, it was quite rare too for girls to focus on STEM subjects for A-levels. One of my friends did and she was very much in a male-dominated environment for years. Nowadays, it's become a lot more mainstream for girls too, thank goodness! You must be so proud of her Jenny, wishing her all the best in her science career! I really am! Thanks Anna - I shall pass that on (she's at a uni interview right now!). Sounds a great kit and campaign. Really important for kids to know they can do anything regardless of gender. Definitely. Girls AND boys - maybe one day it really won't matter and no-one will even give any career choice a second glance :) Thanks for your comment! I was really impressed when I first found out you work in I.T. - in 12 years my partner has only ever had 1 woman work in his I.T. department!